The bathroom, may be the most important place to consider lighting, shadow-free lighting for shaving, grooming, and applying makeup. 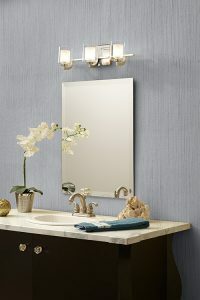 In small bathrooms, mirror lights will illuminate the entire room, but in larger bathrooms, an additional ceiling fixture is needed for general lighting. Wall-Mounted Fixtures can furnish general, task, and accent lighting. Many are designed to match and supplement dining room chandeliers, or to provide hallway, bedroom, or living room lighting. Wall brackets are often used for task lighting at the bathroom mirror. They are available with a choice of incandescent, tungsten-halogen, and energy-efficient compact fluorescent bulbs. You use your bathroom at all times of the day, and the lighting in the space should be functional and flexible to accommodate a variety of tasks. You take a shower each morning, you shave or put on makeup in front of the mirror, and you enjoy a nice long soak in the tub at the end of a long day. With the right bathroom lighting, you can use each area to its fullest extent, and the ambiance of the room will be perfect, no matter what time of day it may be. At Hortons Home Lighting, our co-op member showrooms can help you find the best options for your home, and you can finally create the bathroom that you’ve always wanted! If you’ve ever visited a lighting showroom, you may have been overwhelmed by the number of fixtures hanging on the wall and from the ceiling. 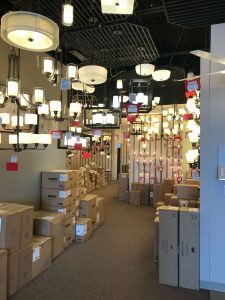 The store may have been set up by room so that you could see what a certain lamp looked like in a modern living room, or how a chandelier is meant to be installed in an entryway. 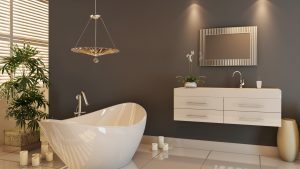 When it comes to bathrooms, contemporary showrooms do an outstanding job of setting up fixtures to show how they add to both the functionality and the comfort of a space. You can find this setup at many Horton’s showrooms, and the staff can help you find suitable options that fit both your budget and your vision of what you want your bathroom to be. Another perk of shopping with a Horton’s showroom is that you have access to a greater number of name-brand options. With products from Kichler, Quoizel, and many other leading manufacturers, you’ll know that you’re getting the very best quality for the very best price, and that your bathroom fixtures are going to last for many, many years. Many homeowners, when shopping for new bathroom lighting, begin their search online . While this is a great way to gather research and begin viewing options, there is something to be said about going into a showroom, speaking face-to-face with a lighting professional, and seeing the lights selection for yourself. Keep in mind is that every Hortons Home Lighting showroom is locally owned and operated by lighting experts who live in your community. Many have gained experience dealing with lighting replacements in their own home or through assisting the the thousands of homeowners that pass through their showroom with lighting projects just like yours each year. When you need bathroom lighting design and installation, let Hortons Home Lighting show you the way to amazing products at great prices. We have more than 300 showrooms across North America, so no matter where you are, you’ll most likely be able to find a showroom near you. Check out our locations today! The staff at each store is always happy to help. When building a new home each room requires lots of attention to detail, and you want each space to turn out exactly how you envision it. When it comes to the bathrooms, many modern designers like to take risks in terms of the layout, the materials, and the lighting. Gone are the days of the simple utilitarian bathroom – today, these spaces are relaxing, spa-like rooms that have every amenity imaginable. At Hortons Home Lighting, we love helping those who are building a new home find the perfect bathroom lights at a local showroom. Even if lighting installation is still months away, it’s never too early to begin choosing your bathroom fixtures. 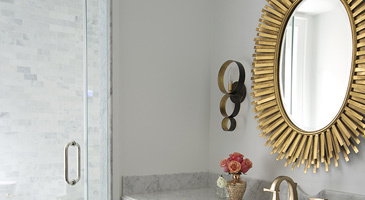 You may spot a vanity light in a Hortons Home Lighting showroom that you absolutely love, and that can inform your decision when it comes to choosing the wall sconces that will be placed on either side of the bathroom mirror. It can also influence the type of decor that you choose for a particular bathroom, such as a nautical theme for the guest bath, or a certain color that you add as an accent in the master bath. Another important aspect of every new home project is choosing the right lighting controls. Standard toggle switches are fine for many applications, but Hortons Home Lighting showrooms can assist you in finding dimmer switches and sensor panels that will enhance your bathroom lighting experience. Take a moment to think about how important it is to be able to see when you get up in the middle of the night to use the bathroom. Wouldn’t it be great if the lights automatically turned on at a low level so that you’re still able to see, but you’re not blinded at three in the morning? With the selection of lighting controls at our member showrooms, you can find everything you need. If you’re building a new home and you’re ready to choose your new bathroom light fixtures, find a Hortons Home Lighting showroom near you for the an amazing selection and expert guidance. Every location is equipped exclusive products from leading brands, we know that you won’t be disappointed with your experience.